For those visitors considering rail travel to Anglesey in north Wales, we hope the following information will be helpful. If using the train for getting to Anglesey is your preferred choice, the island is well serviced by train services from the whole of the UK. Whether you are arriving from Manchester Airport or Heathrow Airport or by cross channel ferry at Dover, getting to Anglesey by train is easy. We also hope to answer some of the frequently asked questions by those travelling around Britain. For your convenience there are two sections, one for overseas visitors and the other for UK based travellers wanting to use rail travel to Anglesey. Firstly, you are likely to be arriving in the UK either by air, sea or possibly by rail via the Cross Channel Tunnel. For those of you entering by air, your most likely arrival point will be the London Hubs of Heathrow Airport, Gatwick or Stansted. Equally, Manchester Airport has become very popular with visitors to the UK. When you get off your plane at say Heathrow, would you like to jump straight onto an express train into central London without any paperwork and waiting for tickets? Do you want the convenience of travelling around Britain without the need to stand in long queues for tickets at a railway station? Does the idea of travelling by train without worrying about paperwork appeal to you? Would you like to have the flexibility of changing your travel plans after reaching your destination? Do you plan on going beyond London or say, Manchester (if you enter UK by that airport)? Does the ability to get off at a station on your way to another destination appeal to you? Are you likely to do two or more long journeys or perhaps lots of small journeys? Do you want to visit Ireland as well as Anglesey? Will you want to travel on Fridays? If you can't catch the train or drive your car why not look at taking the London Holyhead Coach service. Now you can keep up with news and articles about the island by subscribing to our free Anglesey Today Newsletter. Just complete the simple form here; it's as easy as 1-2-3! We hope these questions have helped you to shape your plans while visiting Britain. After all, the UK may be a part of your grand Tour around Europe! There again, your plan may be just to stay in Britain. Either way, the best option for overseas visitors entering the UK wanting maximum flexibility for train travel would be getting a BritRail Pass. There is more than one type, and the best one for you will be based on your likely travel programme. For example, you could combine seeing all that Anglesey has to offer with a trip across the Irish Sea to Dublin. There is a BritRail pass that allows for train travel within the UK and a ferry to Ireland. You may want a good hire car to make your stay on the island a better experience. Learn more about how a Holyhead car rental service may help you. For those visitors from the London and the south east of England, your likely starting point is London Euston. 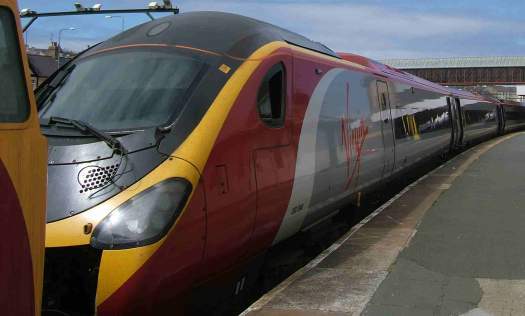 There are regular trains to Holyhead on Anglesey, all of which pass the central hub at Crewe. For travellers from the south, west and east of England, again, you are likely to get a train to Anglesey via Crewe. Here is more information for trains to Holyhead from Chester. Rail travel to Anglesey can be so relaxing and stress free. You can sit back in a comfortable seat with a fine view of the countryside as the train speeds along to your island destination. When you are on our island, however, a great way to get around is by car. This way you can stay on any part of the island and get to your chosen destination within half an hour.